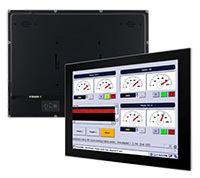 Winmate's line of multi-touch panel PCs go beyond standard industrial panel computers with elegant, edge-to-edge designs, rugged construction, powerful performance, and flexible mounting options. 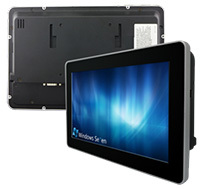 The brilliant True Flat screens, which offer superior readability and P-CAP technology, are available in 10.1" and 15". In settings where power outlets are not available, Winmate has developed a Power over Ethernet (PoE) touch monitor in a compact, 10.1” form factor. This cost effective PoE solution brings power and data transfer via Ethernet cabling for building automation, remote maintenance or testing equipment. Intelligent buildings, which integrate interactive and smart display systems, are on a rapid incline.Winmate’s 10.1" Multi-Touch Flat Panel PC is designed to fulfill the needs ofthis growing market. This panel PC is suitable for home automation and room management systems, and can be used in offices, campuses, or conference centers. By connecting to centralized database, it can provide real time updates for bookings and scheduling, or perform as a synchronous display in meetings. Power over Ethernet (PoE) enables the safe transfer electrical power and data to remote devices over Ethernet. It does not require modification of existing Ethernet cabling infrastructure. 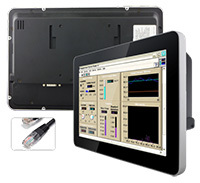 The 10.1" PoE Touch Monitor supports the latest PoE standard IEEE 802.3at/af, and features a rugged industrial steel chassis for durability in even the most rugged environments. Industrial-grade components ensure longevity and reliability, making this an ideal solution for companies looking to increase their operational efficiencies, reduce expensive cabling costs and power consumption.